What is your destiny? How does grace move through you? What does love ask of you? It is said that when you invite the grace of Hanuman, the knower of all hearts, into your life, the obstacles on your path will be removed, and his divine energy will lead you to your destiny. I’ve always been drawn to Hanuman, the ideal devotee: a symbol of strength, perseverance, loyalty, and devotion. Hanuman can be called to teach us the unlimited power that resides within. Through resilience and compassion, we conquer adversity and come out stronger. I’ve been relaxing this past week – my first full week off since opening the studio in East Brookside. I’ve enjoyed taking a break from my usual routine, spending time in reflection as I plan for the future. What a year it’s been! Last summer was a difficult time for me. After years of practicing and teaching yoga all over the metro, I was at a crossroads. I didn’t have a yoga home, and I was feeling heartbroken and disillusioned about many aspects of the path I had chosen. I went back to the foundations of my practice and offered myself to the universe, hoping for direction. Many options appeared, and I was open to all of them, but I kept returning to an unassuming brick building that spoke to me like no other. On the lower level, beneath a dental office, next to a gas station, it said “yoga” to no one but me. Yet, it kept calling: an intimate studio in the neighborhood where I live, walk, shop, eat, and drink; a landlord who believes in my vision and offers support; a friendly corridor with vibrant energy; a place to demystify the practice so no one feels left out; an opportunity to teach a way of life rather than a sequence of poses. A year ago, I signed the lease on the space that has become the Kula. A week later, I taught the first class. Two weeks after that, I launched my teacher training. In a leap of faith, I invited Hanuman’s grace to move through me, and I asked for strength as well. And though the road has not been easy, I’ve learned that even in my darkest hours when I feel the weight of responsibility, I am supported. I have so much gratitude for those who share this journey with me, for those who encourage me, give me hugs, and let me cry – for all the students, teachers, friends, and family that have helped me around, through and over the obstacles. We are truly on this path together, and together we are better. I wanted to create a sanctuary where we can get to know one another, accepting that though we have differences, we are at our core the same; we are all connected. I envisioned a studio where people are inspired to believe in themselves, empowered to choose their path, and able to transform their lives. The work of yoga is the work of our life. When we’re in a space that feels safe and encouraging we succeed in being our best selves, and it feels like destiny. What is yours? 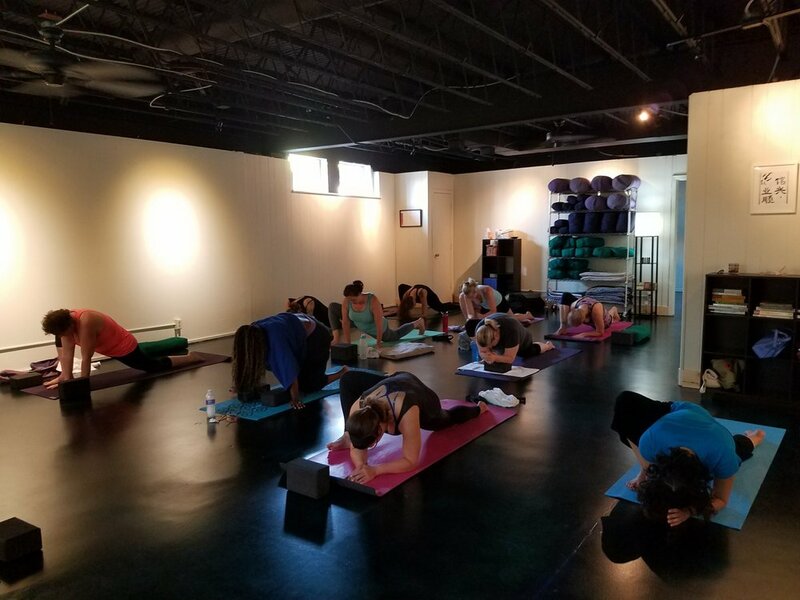 Join us for a class or workshop. We have many options, and we aways have tea to sip and share together as we navigate with love, laughter, and sometimes tears.